Unexpected expenses. Is anything more stress-inducing than this for a college student (or their parents)? Many college freshmen look at the estimated tuition cost for their school, click “Accept” on loans and financial aid to meet that amount, and then relax thinking they are financially set for the year. Basic Necessities: Sometimes the most obvious needs are the ones most easily forgotten. Students living on campus should budget for items like: food, laundry, clothing, and personal hygiene items. Rental Insurance: Most students bring computers and other costly items with them to college, and it brings peace of mind to have insurance which will cover theft, loss, or damage. Extracurricular Fees: Joining a club, organization, or team is a highlight for many students, but most don’t take into account the fees for joining these groups. Explore their websites or ask former members about costs so you can prepare accordingly. Transportation/Travel: Commuters will need to plan to pay for a parking pass, vehicle maintenance, and gas needed to travel back and forth. Those living on campus without a car should budget for bus fare, gas costs (if they ride with friends or carpool), or consider investing in a bicycle. Also, don’t forget to factor in the cost for a trip home! Fun! : A hard-working student deserves a break now and then, and it’s important to budget for it. Going to the movies, eating out, or splurging on a weekend away with friends can be a great part of the college experience! Try to include money for a few “small” fun activities a month (like eating out) and one or two “large” activities/items per semester (like a trip to a theme park with friends after midterms). 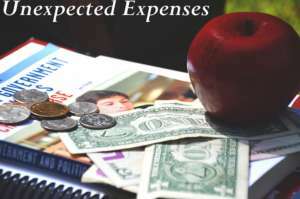 Each student will have different budgetary needs and limits, but it is important for parents and their student to sit down together and carefully consider all expenses before starting college. *Bright Futures offers guidance in this area and is happy to assist you with college planning. If desired, you may also enlist the help of our financial specialist, Raymond VanBuskirk (vanbuskirk@ineva.com).